Don’t be afraid to use your decanter! I think the process of decanting wines is vastly under utilized by wine drinkers, including me, as even the most basic wine can benefit from a splash in another vessel. 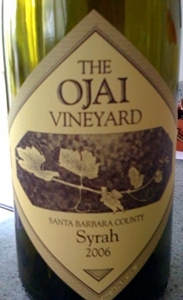 The 2006 Ojai Sryah ($29) on the other hand is a wine that NEEDED to be decanted. I was really looking forward to this wine and had big expectations, and was slightly let down by my first sip after about 20 minutes in the decanter. The first glass was good but wasn’t great, the fruit was still a little tight and underwhelming, not balancing with the structure of the wine. That all changed after an hour in the decanter. I mean, the 2006 Ojai Syrah literally exploded with rich dark fruit and black olive goodness. The Ojai Vineyard website doesn’t offer much information on the vinification of this wine but mentions that they do blend in some Grenache and Mourvedre. A good wine that becomes great after some air exposure and delivers a power packed punch of layered flavors and aromas. The meat notes accompanied by the kalamatta olive notes were unmistakable and were encapsulated by delicious dark berry flavors that went on for some time. The nose on this wine was incredibly powerful, we decanted it and the aromas were flowing out of the decanter like a flower vase. The wine was very big and full, yet the tannins were restrained to mouth enveloping “velvety-ness”. Loads of dark fruit and spice, this was a truly “yummy” wine. It doesn’t say on the website but I remember that the cases production on this was quite small, under 1000. 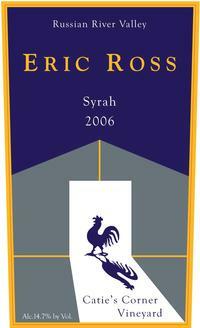 Stop by the Eric Ross Winery in Glen Ellen California to give this Syrah a whirl.